Knox Farm State Park located in East Aurora, is a favorite for family portrait sessions. There are so many different places to take photos. For family portraits, we always like to start with the group photos first, especially if there are little ones involved. We want to make them more comfortable around us. Then we can get into images like this. This was at the end of the session. The sun was setting and there were some beautiful pastel colors in the sky. As you can see, sometimes the only way to get a great reaction from small children is to let them keep their toys or stuff animals in the photo. If we take them away, it can be a disaster. The stuffed pink bear worked out great for this image. She is holding that bear and looks so cute. She looks so tiny mixed into the tall grass. Neal laid on the ground to get this angle. He wanted the tall grass surrounding her and as much of the sky as he could get. All of the colors look so good together too. 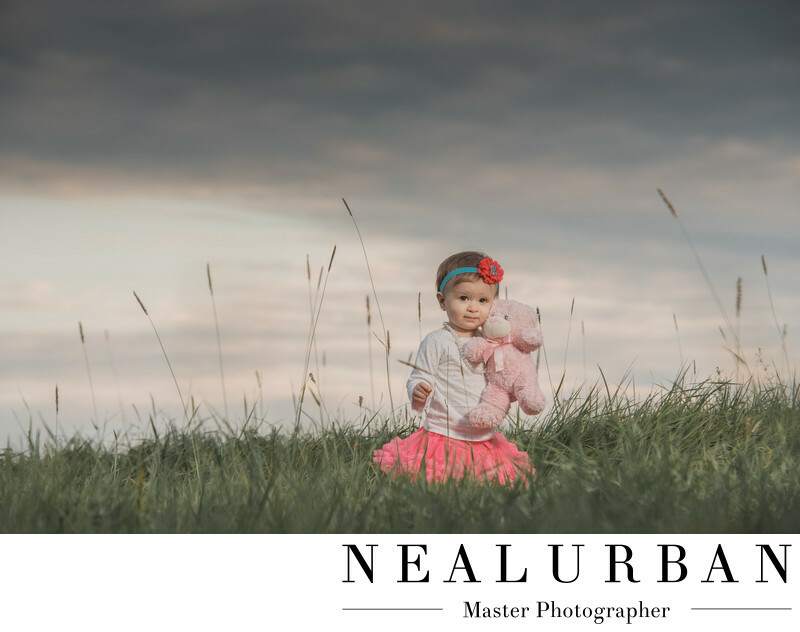 The pink tutu and bear, bring out the pink hue in the sky. Her blue head band brings out the blue hues in the sky. We love her expression too. She has a tiny, curious little smile. She is just happy to be with her favorite teddy bear!